This is a guest post from Odobo CTO Peter Mareš. As the developer program for real-money gaming, we assess the impact that any new software update is likely to have on our developer community. The positive news with iOS 7.1 is that this version presents a great opportunity for all HTML5 game developers and full screen app producers. The most exciting addition is a modification to how Safari handles web apps: it makes development easier, improves the look of games and enhances the player experience. Better still, it is easy to implement. By updating a small piece of code in our Game Development Kit (GDK), every game automatically updated to take advantage of these improvements. In this article, we cover some iOS 7.0 history, prior solutions, and the future ahead with 7.1. In iOS 7.0, Mobile Safari hid the address bar and changed the behaviour of both full-screen browsing and full-screen mode. Although the idea behind full-screen browsing on iPhone was great, it was originally designed for scrollable webpages, not full-screen web apps such as media players and games. For gamers and developers this presented more of a challenge than with the previous version of iOS. Although the changes impacted both device orientations, landscape presented the greatest need for a workaround: if a user tapped the top or bottom of the screen, the browser bars would activate, reducing the screen real estate, interrupting and obscuring the game or application. To complicate matters further, it was not possible to launch the game in full-screen mode. Since no browser event was fired when the browser bars appeared, workarounds had to poll the visible browser area for each frame (we used requestAnimationFrame). This identified when browser bars were both visible and unsought. Once detected, the content was resized to allow scrolling, disabled the app, and presented a ‘swipe up’ message to the user. Once the user swiped up, the app would detect that the visible browser area had been increased, re-enabling and resizing the content back to full-screen. This provided a solution; however, it was a messy hack. On the design side, developers had to change their game design practices to avoid the top and bottom areas (each ~100px high) for any interactive elements to prevent users from triggering the bars. While this reduced the frequency of which this feature occurred in apps, it still presented a user experience challenge. To provide a more natural experience to players, we provided direct feedback to Apple in hopes of creating web app development extensions. iOS 7.1 arrived with a little-publicised gem for every HTML5 developer: minimal-ui. This small addition literally changes the game. Simply adding minimal-ui to our viewport’s meta tag (something automatically handled by the GDK) now solves the challenges presented in iOS 7.0 with one easy step – and being native, it performs exceptionally well. Now, running HTML5 full-screen apps on iOS 7.1 looks and feels great without the need for complicated workarounds sitting behind the UI. Apple has also gone a step further and removed the ‘dead-zone’ at the bottom of the display, which means that users can only activate the browser bars by tapping the top of the screen. When this happens, the bars appear, with a darkened overlay covering the app below. This provides the user with a true native feeling of being ‘out of the app’. Simply tapping in the content space will intuitively bring back the full-screen app. So whatever you feel about iOS 7.1 in general, for gaming enthusiasts and HTML5 developers, this new update is one we’re applauding. Odobo is the HTML5 games development program and content Marketplace for the regulated real-money gambling industry. The Odobo Game Development Kit (GDK) provides game developers with a framework for their game client production and access to state-of-the-art technologies to assist in their development of regulatory-compliant HTML5 games for real-money play. Odobo games are made available to participating licensed gaming operators via the Odobo Marketplace – the B2B ‘app store’ for the gaming industry. Developers earn royalties based upon the revenue generated by their games and access additional affiliate commissions when they market their games and drive new players to the gaming operators. Developer’s recently added to those working on Odobo’s platform are: AppleJack Gaming, Wild Game Reserve, Core Gaming, Trimark, Red7 and Probability Jones, with others to be announced soon. 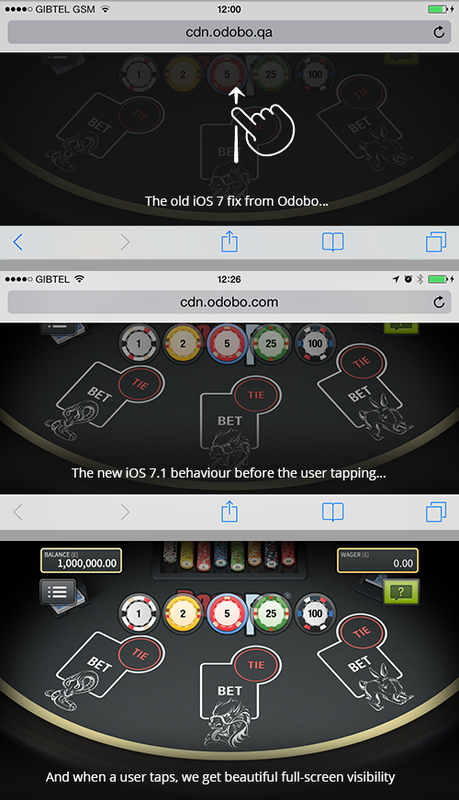 Odobo, based in Gibraltar, is licensed and regulated by the Gibraltar Gambling Commission. The company employs over 80 staff.